Myanmar opposition leader Aung San Suu Kyi, center, rides a boat on her way to a monastery where flood victims are sheltered, in Bago, northeast of Yangon, Myanmar, Aug. 3, 2015. The United States said it will announce an aid package to help flood victims in Myanmar, as international aid efforts have accelerated after the disaster affected tens of thousands across the country. Speaking Wednesday in Kuala Lumpur, U.S. Secretary of State John Kerry said the U.S. Embassy in Yangon is working closely with Myanmar officials to determine priorities for the aid. Kerry said the U.S. will provide $600,000 in disaster assistance to Myanmar, also known as Burma. The Myanmar government has appealed for international aid to bolster relief efforts and Deputy Director General of Foreign Affairs Kyaw Moe Tun told VOA Burmese that foreign embassies in Myanmar have been asked to provide food, relief materials, medicine and water purifiers. "We hand over the humanitarian assistance we receive from international donors to the Relief and Resettlement Ministry and Social Welfare Deptartment," said Kyaw Moe Tun. "They coordinate with State and and Divisions that are in urgent need and distribute accordingly. 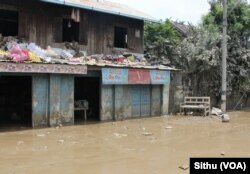 We also welcome donations of materials that will help the rehabilitation of the flood victims." He added that Japan has pledged $150,000 in aid, while Vietnam is providing clean water worth $20,000. Aid groups and volunteers have told VOA Burmese that relief workers are struggling to reach some hard-hit areas. Pierre Peron, a spokesperson for the United Nations Office of Coordination of Humanitarian Assistance in Yangon, said the agency is trying to gain access to the affected areas. "What the U.N. is doing at the moment is working with the authorities to go on assessments," he said. 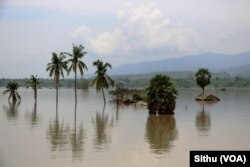 The UNOCHA said it also aims to help flood victims recover from the disaster. Myanmar’s Ministry of Social Welfare, Relief and Resettlement said 69 people have died and more than 250,000 people have been affected by flooding that was caused by last week's monsoon rains. Thailand and China have also joined in donating relief supplies. A 10-member Chinese rescue team arrived Tuesday in Yangon to extend a helping hand in relief efforts.